In a Vase on a Monday: Beat the Blues! Love the dark sweetpeas with the bright orange! Lovely combination in your pretty blue pitcher. The sweet pea has great color. I thought your Zinnia was a helianthium when I first saw it. Great colour and a lovely contrast to the sweet peas. Wow – those sweet peas are stunning! Are you able to ask your friend Norma what variety they are? I wouldn’t have thought the others were zinnias either although one of our US vase post-ers has featured a bright zinnia mix in her vases. Thanks for sharing your jug with us. Hi Cathy, as usual I felt sort of humbled after looking at all these wonderful, really artful vases all the others created…my own one being more like „hop-into-the-vase-that’s-it-like“…I think CathyT could be right with the Ripple type. Let me know if you like seeds, I gladly send some but have to tell you they are not scented, at least not much. Perhaps we find it hard to accept that our own vases can be ‚artful‘ when we don’t feel we have been artistic in producing them….? Thanks for the offer of seeds – I was nearly going to say yes, but decided that as I already have other sweet seeds I better say no after all (this year anyway), pretty though they are. I have some ‚Ruby Eclipse‘ sunflower seeds if you would like some though, and have you managed to find a ‚Red Dragon‘ yet? Lovely Annette, I love purple and orange together. 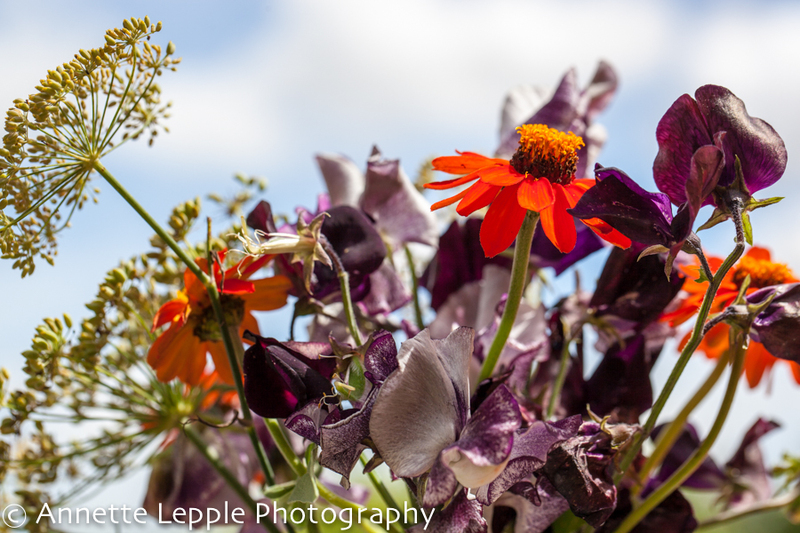 The sweet pea is gorgeous and I love the orange Zinnia, I thought it was a Tithonia at first. Beautiful! Perfect combo Annette. The colours look wonderful together. Stunning Annette. What a lovely combination! Lovely purples and oranges and a charming shot. The sweet pea looks to me like one of the ‚Ripple‘ types (they were bred from a pre-17th sp whose name escapes me!). Just lovely Annette – and the sunshine!!! Those sweet peas are one of the nicest purples I’ve seen….quite amazing! I love the color combination especially those sweet peas. A beautiful vase for November. Nice combo, Annette. So pretty and lively colors. 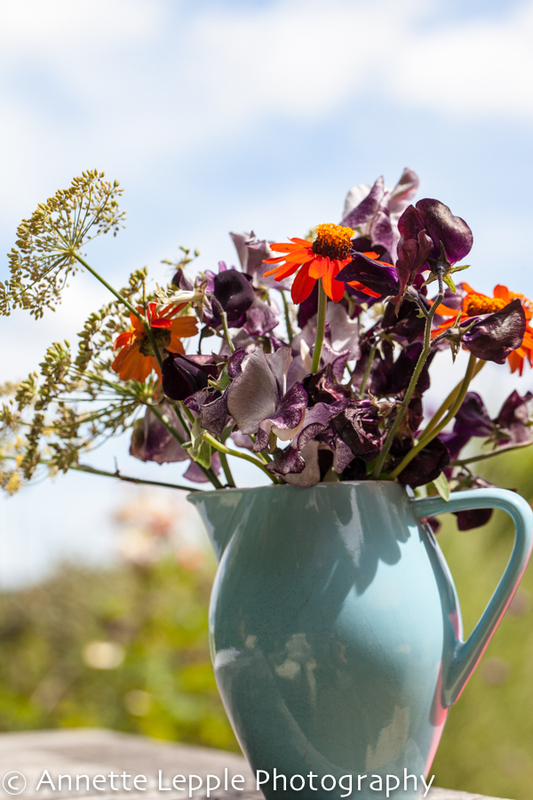 You are so lucky to still be able to use sweet peas and zinnias and the fennel seed heads work perfectly at this time of year! Thank you for sharing a lovely vase. Pretty! I do love fennel heads in a vase, they add so much architectural interest, and the occasional lovely scent too. Beautiful! 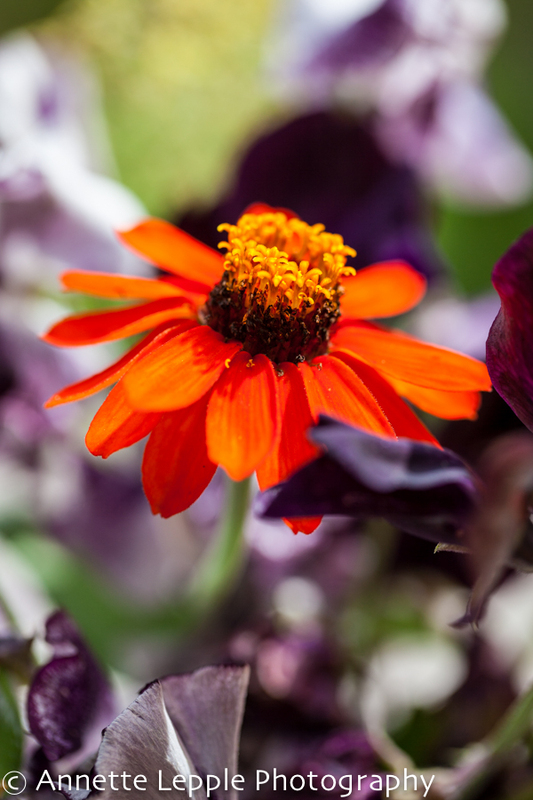 I love the contrast between the bright orange zinnias and the plum sweet peas – stunning. And the fennel heads are the perfect accompaniment. I find I use them a lot in my vases too. Oh that orange zinnia positively glows Annette. I think that the sweet pea is ‚Wiltshire Ripple‘. My sweet peas petered out towards the end of October. I’m missing them. You may not get a chance to join ‚In a vase on Monday‘ every week but when you do, it does not disappoint. I really like the fact that you have added the fennel seed heads to your pretty blue jug. i have never grown Zinnias but they are on my list for 2015.D. Orange Zinnias are my absolute favorite.